Around the beginning of just about every summer, my husband and I make big plans to try eating raw. It makes sense right? No need to fire up the oven all summer long, there’s lots of fresh produce available, and I’m sure we’d feel great. Alas, “Let’s eat raw this summer,” turns to “Let’s eat raw for July,” and eventually to “How about we just have a salad with every meal?” While I do eat quite a bit of raw fruits and veggies all year long, going completely raw can be a big commitment, and to be honest, I’m not sure my raw food cooking skills are up to the challenge just yet. One aspect of raw food prep that’s actually really easy and I can totally handle is dessert. Surprising right? The awesome thing about raw desserts is that they typically take advantage of naturally rich or sweet plant-based ingredients that work best in their natural state, like nuts and fresh fruit, which is exactly what I’ve crafted these tasty little parfaits around. Cashews make a fantastic base for vegan cheese (more details on that here), and cheesecake is no exception. Add a bit of raw sweetener, blue agave in this case, and raw cacao powder, and you’ve got something that tastes like chocolate cheesecake. I decided to simplify and layer my cheesecake ingredients in parfait form, since it makes life a bit easier, tastes just as good, and looks extra cute. Since fresh summer berries are still available for at least a little while, and because I love the combination of chocolate and raspberries, I went and included fresh raspberries. Feel free to experiment with other fruits if you make this when berries aren’t so easy to come by. There isn’t much that doesn’t go well with chocolate cheesecake, so get creative. Like my summer diet, these parfaits aren’t necessarily completely raw. The whipped coconut cream is a must, and canned coconut milk may have been heated during processing. Yes, there are ways of guaranteeing a completely raw coconut whipped cream, and they generally involve cracking open a fresh coconut. In the interest of making these easy and delicious, I didn’t think you’d mind creating some whipped topping from a can of coconut milk. Layers of rich cashew-based vegan cheesecake, fresh raspberries, and whipped coconut cream, these decadent little parfaits are totally vegan and (almost completely) raw. Place all of the ingredients into the bowl of a food processor fitted with an S-blade. Process until smooth and creamy, stopping to scrape down sides of bowl as needed and thinning with a bit of extra water if needed. 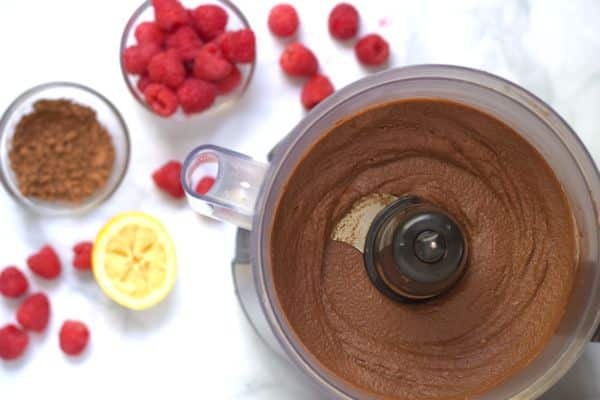 If you’re using agave nectar for this layer, set aside a one or two raspberries per parfait for garnish, then place the remaining raspberries and agave into a medium bowl and toss to coat. Open the cans of coconut milk or cream and scoop the solids into a medium mixing bowl. Discard the liquid or save for another use (it’s great for smoothies!). Using an electric mixer, beat the coconut cream on high speed until it’s light and fluffy, about 1 minute, scraping down the sides of the bowl as needed. Add the agave and beat until fully blended. Divide the chocolate cheesecake mixture among six to eight parfait cups or 1-cup mason jars. Place the raspberries over top of chocolate cheesecake layer, and then divide the coconut whipped cream over the raspberries. Top each parfait with one or two of the reserved raspberries. Optionally, dust with a bit of cacao powder to garnish. Prep time does not include the soak time for the cashews or refrigeration time for the coconut milk or cream. Coconut milk or cream will work here, just be sure to use the kind from a can and not the carton (which is usually a blend of non-dairy milks) or cream of coconut (which is a sweetened product used for cocktails). Coconut milk and coconut cream work equally well, but using coconut cream will yield a slightly larger batch. Make sure your coconut cream or milk has separated before you begin whipping it. Placing it in the coldest part of your refrigerator should help with this. I sometimes even turn the temperature down a notch to make sure it fully separates. The solids, which you’ll be whipping, will be white and slightly softer than butter. The liquid will be just a bit thicker and more opaque than water. Feel free to substitute cocoa powder for cacao powder or non-raw agave or maple syrup for the raw blue agave. These ingredients work just as well, but aren’t raw. 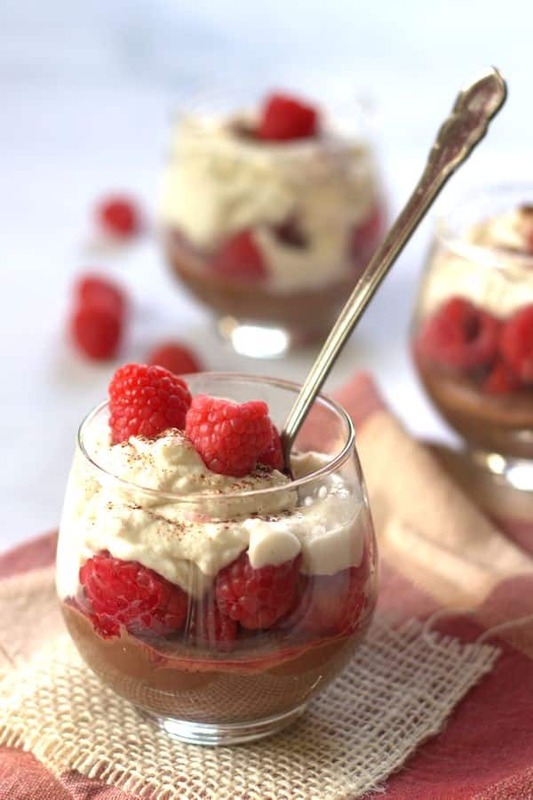 These look so decadent – I love the combination of chocolate and raspberries and cream! Oh yum! I LOVE fresh fruit with vegan chocolate mousse/cheesecake. The whipped coconut cream on top just puts it over the top, I’ll have to make these! Agreed! I hope you get to give them a try, and enjoy! !